For those of us who love the outdoors and driving, a caravan is the best way to combine these two pastimes into the ultimate outdoor experience. Caravanning can be an excellent way to see the countryside, but unless you’re properly equipped and your caravan is up to date, the trip can become uncomfortable and miserable before too long. The best way to make the most of your caravan holiday is to ensure that you have all the latest caravan accessories. Some of these are purely for aesthetic or comfort purposes, but others in this article are crucial to maintaining your safety. So continue reading to find out which accessories you might need for your caravan before you leave. A caravan is like your home away from home. There are endless possibilities out there for you to customize it to reflect you and your style as well as ensuring that you have a comfortable standard of living while on the road. According to various sources, we have compiled a list of the 10 most essential caravan accessories. If you plan on doing any cooking, drinking or cleaning while away, then your caravan needs to have a fresh water supply and somewhere to store it. While you can use a regular 20+ litre water container for your fresh water supply, the kind you want for your caravan is one that has wheels. 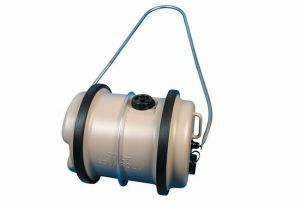 With one of these, you can easily wheel your water supply to the caravan and back to wherever you need to fill it up and they are also much easier to pack and maneuverer. Some of these containers can hold massive amounts of water (more than 80 litres) and will cost you anywhere between $50 and $140 in Australia depending on their quality and capacity. Of course, if your chosen campsite has a fresh water supply there then you may not need one of these, but they will still save you plenty of time and effort. In addition to having a fresh water container, you will also need a waste water removal system, unless you want things to get smelly. Waste water needs to be removed from the caravan regularly, and this can be achieved through a waste water container, which is pretty much the same thing as a fresh water container. The key difference is, they sit underneath the caravan and direct the waste water into it through tubes. You then wheel the container to a service point to be emptied. These containers cost about $80-120 on average. We really can’t stress enough how important it is to manage your hygiene while living in a caravan. There are two types of toilet chemicals for caravans: flush tank additives and waste tank additives. A general rule of thumb is that flush tank additives are coloured pink and waste tank additives are green. Caravanplus.com.au has a more comprehensive guide on how to correctly use toilet chemicals for your caravan. If you choose an electric portable heater, then you need to make sure that the campsite you’re staying at has an electrical hook up. Alternatively, you can buy electric fans and heaters that are rechargeable, and these will cost you roughly $100-$150. The most common option for people staying away from a designated campsite is the portable gas heater, which uses the on-board gas supply of the caravan rather than electricity. Diesel heaters are far more expensive and noisy (they can cost almost $2,000 here! ), they are far more efficient at heating larger areas. There are plenty of options out there, so do your research before buying! Either reversing cameras or towing mirrors should be a high priority if you aren’t particularly confident when it comes to your backing skills. 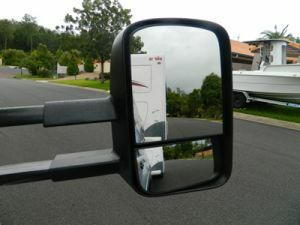 Blind spots can be a huge concern when backing a caravan due to their size, and a towing mirror allows you to see the entire length of the caravan. Depending on their quality and size, these towing mirrors will set you back anywhere between $25 to $200 on average. Towing mirrors help with blind spots, but reversing cameras help you actually move the damn thing without taking 20 attempts to back it into the right spot. They give you eyes in the back of your head and significantly help with the stress of backing such a large vehicle, especially if it’s not yours. According to The grey nomads, reversing cameras consist of the actual camera, a monitor and a cable that connects them together. All of these will commonly cost about $600 if you don’t want to cut any corners. Being away from civilization means there is no one around to bail you out if you break down, so you’ll need to have the tools to do it yourself! According to www.withoutahitch.com.au, some of the most essential tools for caravans are wheel braces and wrenches, tyre levers, air compressors, a screwdriver set, sealant and wheel blocks just to name a few. In addition to having a tool kit, you also need to have a spare tyre or two on-board in case of emergency. This seems self-explanatory, but you’d be amazed at how many people don’t have spare tyres with them when they need them the most. If you buy a new caravan, then the chances are that it will have on already, but older models may not, particularly if you buy them second hand. It is also crucial that you match the spare tyre to your caravan’s existing wheels. Due to the relatively cramped living conditions compared to a house, caravans can quickly become messy, particularly if you aren’t well organized and are living with a large number of people. To counter this problem, there are numerous different caravan storage accessories that you can buy and customize your caravan with to make things look a little nicer. You have many more options with these storage solutions, as they are often not restricted to caravans. Common housekeeping items like collapsible crates, drying racks and shoe racks are small enough that they can fit inside your caravan without restricting your movement. You can also hang things like hooks and hanging wardrobes from your caravan’s walls and ceiling to save even more space, which is something many campers seem to forget. If you feel like these accessories will detract from the aesthetic of your caravan’s interior, then you can always invest in exterior storage like a rear-mounted storage box. These storage boxes can cost in excess of $500, but can be a great way to find extra space for storage. You can really afford to be creative when it comes to storage solutions though, so consider other cheaper options before settling on one of these. We live in a new age of television, which means we also live in a new age of spoilers! Going on a week-long camping trip can mean missing out on the release of the latest TV shows, but fortunately there is a way to avoid this. If you don’t want to miss your favourite shows, or just feel like watching deal-or-no-deal while away, then a satellite dish offers you the greatest flexibility. Size and portability are the key features you’ll need to consider when buying a portable satellite dish, as any satellite smaller than 80cm will not provide any signal in rural areas. Unfortunately, these dishes can be a bit pricey, costing anywhere from $700 to $3,000 in most cases. Given the cost of these satellite dishes, it is crucial that you think long and hard about whether you can survive without TV for however long you’ll be camping for. If you decide that you can’t, then it may be worthwhile paying a licensed professional to install your satellite or you. The biggest advantage of having a solar panel in your caravan is that you won’t be reliant on the campsite’s main power, giving you more independence in how you use your electricity. While most caravans come with either a 12V or 24V battery system that allows for charging, having a solar panel allows you to stay in remote locations without access to electricity. Some solar panels on the market can generate up to 600 watts a day for your caravan, which is enough to power a fridge for 24 hours or a DVD player for 3. Ideally, you want a portable solar panel that is also flexible, as they are easier to install and are generally cheaper as well. Caravan theft is definitely a thing, due to how exposed they are as well as the fact that thieves see them as easier targets than homes. While you can have your stuff stolen from inside, it is not uncommon for entire caravans to get taken by the more professional thieves. Caravans are an extremely expensive investment, so you need to make sure that you are covered for all areas of potential theft. Wheel clamps: They take seconds to put on, but are extremely difficult to remove without the right equipment. 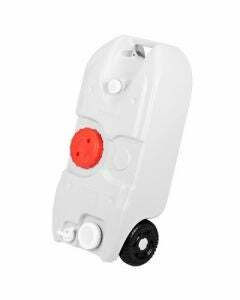 Wheel clamps are fitted to the caravan’s wheels while stationary, and these alone will likely deter thieves from attempting to steal your caravan. They won’t stop them from trying to get in however. Hitch locks: Hitch locks attach to the tow bar, and prevent it from being attached from another vehicle until they are unlocked. Many caravan insurers will insist that you have a hitch lock as a minimum level of security in order to qualify for cover, but like wheel clamps, they don’t do anything to prevent unauthorized entry. Alarms: There are a huge range of caravan alarms out there, the most expensive of which use advanced technology to keep unwanted intruders away. They work the same way as home alarm systems, but are less expensive to install in most cases. Tracking devices: For less than $170 a year, you can track your caravan by using a GPS tracking device that is invisible to most unsuspecting intruders. These will allow you to track and recover your vehicle if it does get stolen, and can reduce your insurance premium if installed by a specialist. There are so many others options out there that can help you secure your caravan, so do some digging to find the devices that are suitable for you and your budget. Caravan experts without a hitch also have a highly detailed article on ways to improve your caravan’s security, which you might find very useful. You may also want to find out more about caravan insurance. Last of all, awnings. Mostly for aesthetic purposes, awnings can also provide shelter from the sun and can allow you to pull up a chair and relax without getting sunburnt or rained on. An awning is a sheet of canvas that is stretched outwards to provide cover. Most modern makes come with an awning as standard, but if not, you can buy them in a wide range of prices. The cheaper, more basic models can cost less than $100, but the market leading models can cost more than $700. They do look amazing though, so if you want to camp in style, then by all means consider one of these. Caravans have come a long way in the last few decades, and this article is just the tip of the iceberg when it comes to customizing your caravan. There are countless different options out there, and in order to enjoy your travels as much as you can, get out there and see for yourself what you can get. It really comes down to being as practical as possible with what you can afford and what you need to be comfortable. Happy camping!